Next week sees Cigarette Burns in collaboration with Zippangu Fest bring two classics of kaiju to the screen in an incredible double bill screening: first up, the ultimate heavyweight bout of KING KONG VS GODZILLA, followed by the nefarious fungus MATANGO. Both films were directed by the most prolific and well-regarded man-in-chair behind the men-in-suits, Ishiro Honda. Here’s Paul with a look at two other seminal slices of Japanese monster mayhem from the legendary director: RODAN and MOTHRA VS GODZILLA. RODAN was probably the first giant monster film (daikaiju) to make an impact in the United States after the original GOJRA and its Americanized edit GODZILLA: KING OF THE MONSTERS. It’s seen by many as a quasi-sequel to his genre-defining 1954 film, arriving as it did shortly afterwards, whereas in fact the prolific Honda had made five films in Japan in the two years between the releases of GOJIRA and RODAN, including HALF-HUMAN, a kaiju that has since been almost completely withdrawn from release due to some racially questionable content. In the film ‘Rodan’ is the name given by biology egghead Dr Kashiwagi to the enormous, super-sonically quick Pteradon dinosaurs that emerge from beneath the earth and destroy the Japanese town of Fukuoka (although in the US version the town is renamed to Sasebo – depending on who you talk to, this is either due to there being a number of US diplomatic facilities in Fukuoka, or to avoid any potential awkward, unsavory pronunciation from the US voice cast). Kashagawi theorises that they may have been stirred from their slumber by the impact of nuclear testing on the earth’s crust – while this is never confirmed, the rather on-the-nose, stoney-faced prologue comprised entirely of stock footage that accompanies the US version seems to all but confirm it. You’ll notice that’s dinosaurs in the plural – and not only are there two Rodans, but they’re not even the first monsters to raise hell in RODAN. These are the impressively disgusting Meganulon, giant drangofly larvae that are responsible for the number of mysterious miner deaths in the opening stages that alert the authorities that something awful is going on underground. In these early scenes RODAN feels very much like a homage to THEM! in the way the monsters are hidden out of view for a surprisingly long time, as the baffled victims attempt to figure out what could be responsible for the carnage. 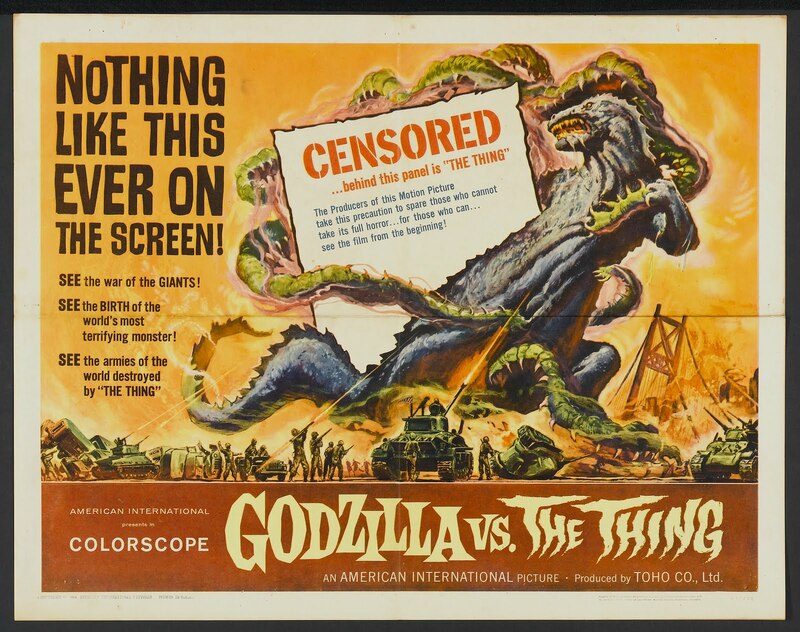 Despite this tense, scary beginning, the bright Technicolor photography, slightly muddled metaphorical aspects and occasional monster overload of RODAN means it feels like a much lesser work than the original Godzilla, which has a much more creepy and serious atmosphere. The slightly belwo average voice-dubbing in the American version doesn’t help, despite many of the voices being provided by Mr Sulu himself, George Takei. That said, RODAN actually manages to build to a genuinely emotional climax, wrenching a tragic, KONG-like ending out of an unlikely romance. In many ways RODAN feels like a halfway between the original GODZILLA and the later, wackier kaiju that followed, while never becoming as full-on outlandish as the likes of KING KONG VS GODZILLA. 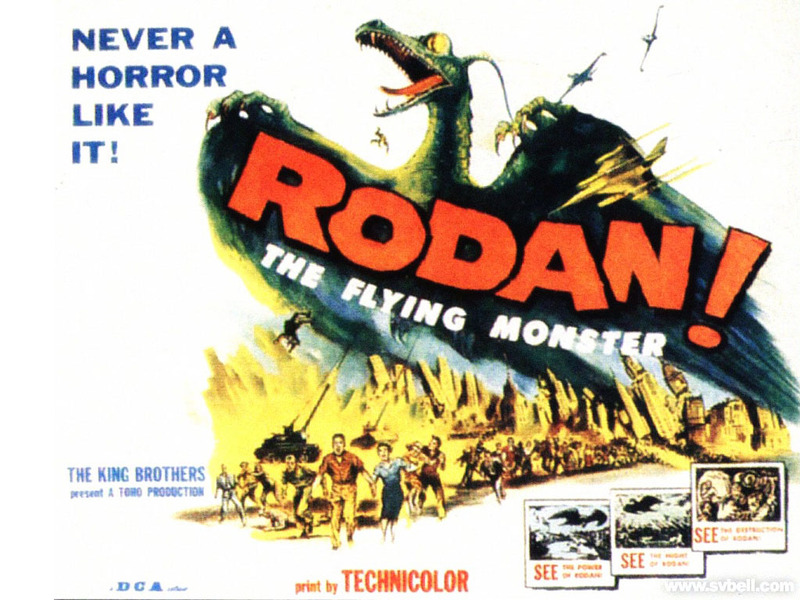 Ultimately, RODAN delivers where it counts – big smashy monster carnage. Despite being a very early kaiju, the effects are surprisingly decent, and the scenes of Fukuoka/Sasebo’s destruction are impressive. Next up is MOTHRA VS GODZILLA, a film that comes nearly after decade after RODAN. By this point, Honda could direct a decent kaiju in his sleep, having rattled off the likes of KING KONG VS GODZILLA, MATANGO (Hey, wouldn’t it be great if somewhere was showing those films in a double bill soon? ), and the original MOTHRA by this point. The mothra was conceived as a new daikaiju for the Toho stable, and would ultimateprove to be one of its most popular. A colossal lepidopteran with characteristics both of butterflies and of moths, Mothra is the god of Infant Island, a small land mass previously used for nuclear testing inhabited by mutated plants, native tribes and two tiny priestesses, played by sixties Japanese pop duo The Peanuts. The beast was originally awakened (or more accurately, hatched from a giant egg) in MOTHRA when the priestesses were captured and transported back to America to perform in a circus, forcing her to swim across the ocean in larval form, build a cocoon in Tokyo Tower and start ranining desctruction on the city from the skies. Despite this, Mothra is one of the most obviously good guys of the Toho stable of giant monsters, proving herself to be largely benevolent and mostly acting on behalf of the human race – unless some starts messing with her eggs, in which case don’t plan on hanging out in any Tokyo buildings any time soon. Compared to Godzilla’s flat-out raging at the human race (he would eventually ‘turn face’ and become Japan’s protector in later films, but he was still solidly villainous at this juncture), this made Mothra the perfect foil for a ‘VS’ film, and so MOTHRA VS GODZILLA came into being. When a giant egg is discovered washed against the shore, another pesky entrepenuer steals it away despite protests from the pint-sized Peanut sisters. He may have got away with it too, if it weren’t for that meddling 200-foot mutant dinosaur Godzilla, who rises out of the desert in a memorable entrance and promptly begins smashing everything, as is his wont. This leads the Japanese government, who struggle to even slow him down with their paltry tanks and weapons, to call upon the Peanut sisters to persuade Mothra to help them out. Reluctantly agreeing, the two throw down in a number of epic battles that will have big implications for both of them. MOTHRA VS GODZILLA is a lot of fun, carrying the rollicking adventure vibe of MOTHRA over as opposed to the more horror-focused GODZILLA or RODAN, as well as MOTHRA’s pro-environment, anti-capitalist message. It’s hard to dislike any film that features the pint-sized Peanuts scurrying around, and it’s one of the best paced and most tightly plotted of the ‘VS’ films. Special notice should go to the score, by Akira Ifukube, which is bombastic and fantastic in equal measure. The special effects are a mixed bag – it features some of the best man-in-suit acting you’ll see from Katsumi Tezuka in the Godzilla outfit, but unfortunately as Mothra is one of the only daikaiju not to be portrayed by a man in a suit (instead portrayed by an elaborate puppet) their fight scenes occasionally look like two action figures being awkwardly smashed together by an excitable five-year-old. To be honest, however, I’m not even sure if that’s a criticism – it’s all part of the wonderful goofy charm of these technically innovative, thematically interesting, downright fun movies. Follow Paul Martinovic on Twitter, or check out more of his writing at Kill the Giggler. This entry was posted in Paul Martinovic, review, Uncategorized and tagged daikaiju, Ishiro Honda, kaiju. Bookmark the permalink.